Freeman House circa 2000, at MRC headquarters. 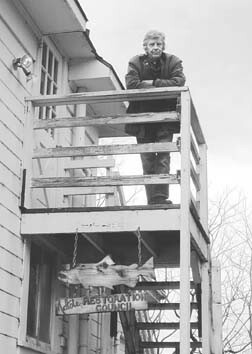 Freeman House, author of Totem Salmon and founder of the Mattole Restoration Council, died Saturday, June 23. He was 80. House was part of a cohort responsible for what is considered to be the "first community-based restoration effort in the state of California." David Simpson, co-founder of the MRC, recalls meeting House in the 1960s, when they both lived in the Haight-Ashbury district and were part of a group called "The Diggers," which Simpson described as "radical free form social workers." They wrote their own newspapers and provided free meals in Golden Gate Park for the scads of young people who had heeded Timothy Leary's call to "turn on, tune in, and drop out." House decided to start a salmon fishing collective and bought a boat he christened The Bare Minimum, which at one point he and Simpson used to ferry water to Native American protesters occupying Alcatraz Island. House moved to the Mattole Valley from San Francisco in 1980, one of many who traded in the Haight-Ashbury scene for a back-to-the-land lifestyle. In his 2000 memoir Totem Salmon: Life Lessons from Another Species, he recalls standing in the doorway of his trailer next to the Mattole River on New Year's Eve 1982, listening to the Grateful Dead play at the Oakland Coliseum and then turning the music off to listen for the sound of a king salmon "struggling upstream." King or "Chinook" salmon were considered to be doomed at that time, House wrote, with logging and earthquakes combining to bring sediment into the streams, warming the water. House would go on to help form the Mattole Watershed Salmon Support Group and, in 1983, the MRC. 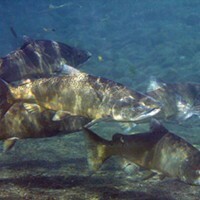 The groups, formed of locals dedicated to the concept of "bioregionalism," would go on to do intensive work in upslope restoration, restoring native grassland and helping maintain the Chinook population by use of weirs, trapping spawning salmon to fertilize and incubate their eggs. The organization also trained local people to count spawning salmon and carcasses, quantifying the diminishing return of the species. "Freeman was a man of incredible integrity," Simpson says. "When he took on a project he knew it was important. [The project] may have been born but it wouldn’t have reached the maturity it did if it weren’t for Freeman." Seth Zuckerman, who also worked with Simpson, recalled that when he first met House in the 1980s, the family was living in "one or two heated rooms of an otherwise drafty barn," while House pursued his work on the water. "When I asked him about that, he said, 'The little house can’t be in order until the big house is in order,' [i.e., the watershed. ]," Zuckerman said. According to Simpson, this year marks the biggest return for Chinook salmon in the Mattole watershed since 1981. Dates for a memorial for House have not yet been finalized. He is survived by his partner Nina Blasenheim and his daughter, Laurel House. You can read more about his life and work in a 2000 cover story in the Journal, found here. 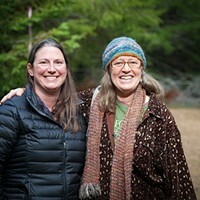 Editor's Note: In the interest of full disclosure, Linda Stansberry is a board member with the Mattole Restoration Council. Photo Courtesy Of Thomas Dunklin.